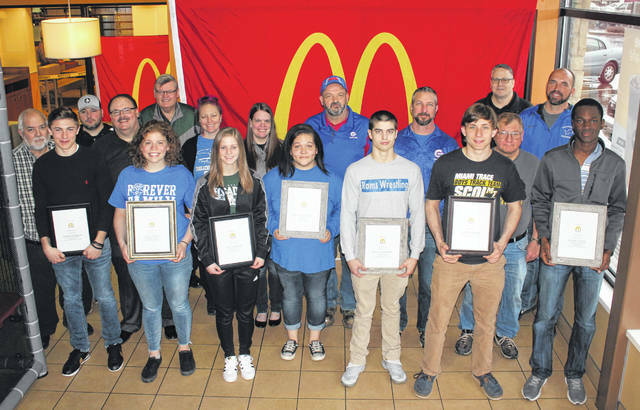 McDonald’s of Fayette County and Jamestown on Saturday recognized nine student-athletes for the 2018-19 winter sports season. The student-athletes were interviewed by Randy Young for a live Facebook program and were served breakfast. (front, l-r); Nicholas Epifano, Fayette Christian School, basketball; Julie Bailey, Washington High School, swimming; Taylor Brown, Fayette Christian School, basketball; Anna Williamson, Greeneview High School, bowling; Devan Hendricks, Greeneview High School, wrestling; Andrew Amore, Miami Trace High School, bowling; Blaise Tayese, Washington High School, basketball; (back, l-r); Randy Young, commentator and interviewer for the Facebook broadcast; Ben Ackley, Miami Trace High School girls basketball coach; Nick Epifano, owner and operator of McDonald’s of Fayette County and Jamestown; Larry Fitch, Fayette Christian School principal; Katie Kasberg, Washington High School swim coach; Angela Harris, Fayette Christian School girls basketball coach; Dave DeBord, Greeneview High School bowling coach; Mark Matt, Greeneview High School wrestling coach; Ron Amore Sr., Miami Trace High School boys bowling coach; Aaron Hammond, Miami Trace High School Athletic Director and Mark Bihl, Washington High School Athletic Director. There are pictures of Washington High School’s Hannah Haithcock and coach Samantha Leach, basketball and Miami Trace High School’s Olivia Wolffe and Ben Ackley, basketball, in today’s sports. Not pictured: Gary Shaffer, Fayette Christian School boys basketball coach and Connor Scott, Washington High School boys basketball coach.